The new Tottenham Hotspur Stadium will host its first NFL game when the Chicago Bears play the Oakland Raiders on 6 October. The £1bn multi-purpose venue, which opened earlier this month, will also welcome the Carolina Panthers and Tampa Bay Buccaneers on 13 October. Wembley Stadium stages two games, including 2018 Super Bowl runners-up the LA Rams against the Cincinnati Bengals. The NFL season starts on 5 September. The Tottenham Hotspur Stadium opened on 3 April for the club's Premier League match against Crystal Palace. 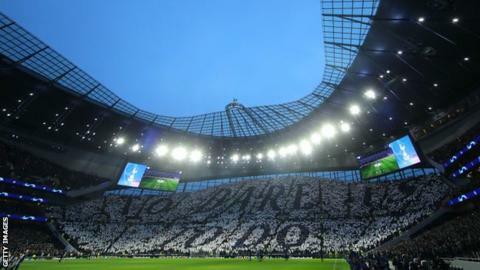 The 62,062-seater arena was due to host its first NFL game in 2018 as part of a 10-year agreement with the league, only for it to be switched to Wembley because of delays in its construction. The NFL's International Series concludes on 18 November with a game between the Kansas City Chiefs and the Los Angeles Chargers at Mexico City's Azteca Stadium.